The clip below might be cringey and awkward for you but for mmDust, it could possibly end his stream and speed running career. Michael Duarte or more known as “mmDust” is a speedrunner who also happens to be a Twitch affiliate. He is known for speed running Resident Evil 7 because he currently holds the speed running world record for it. The incident occurred at one of TwitchCon’s panels that aims to help new streamers refine themselves and their brand. And in this panel, mmDust is one of the three speakers alongside Elspeth and Bikeman. In the clip, you can see that someone is saying that she not only wants to relate to the streamer she is watching but also wants to have this kind of relationship with them because, she adds “I don’t want to talk to a f-king wall”. mmDust then responds in the worst possible way by saying that he does not want his viewers to relate to him because he thinks he’s “better” than the average person. Admitting that he has some kind of ‘low-key god complex’. You can tell that he knew what he was getting into by the way he stumbled on his words even saying that “there’s no good way to say this” and then continuing his bold statement. The clip was posted on Twitter and has been viewed over 6 million times even drawing big time YouTuber Pewdiepie to react to his clip. He allegedly has said that he is not going to apologize for his words on Twitter and even going as far as to joke about them even more. He has since deleted those Tweets however. “Weird that people think I beg for subs and donations (when i dont) or think that I dont realize streaming the way I do will hinder my stream when it comes to making money from it. He then apologized on Twitter with a Twitlonger. It’s indeed quite long but here’s an excerpt. “Let me be clear: I DO NOT believe that my life is any more valuable or important than the life of another. I DO NOT expect or feel entitled to anything from life to be given to me over another person. I felt like this mindset was very healthy for me and I feel like most people who are successful at what they do must believe this as well. I attribute the most growth I’ve had as a person to living by that mindset and I wanted to share with the audience that putting everything you have into what you do is the best way to feel satisfied. I wanted to express that having a mindset where you are complacent with being average or with producing content that you don’t fully believe was made to the best of your abilities can kill passion and make you feel horrible. As you all know with the internet, people will dig deeper into the picture to find more interesting things or possibe dirt on the person. Some people refuse to believe his apology adding that this just like Logan Paul’s apology about his suicide forest video. People claim that he does indeed think he is better than others by showing his old panels which he has since changed. mmDust’s old panels. He has changed them after the incident. 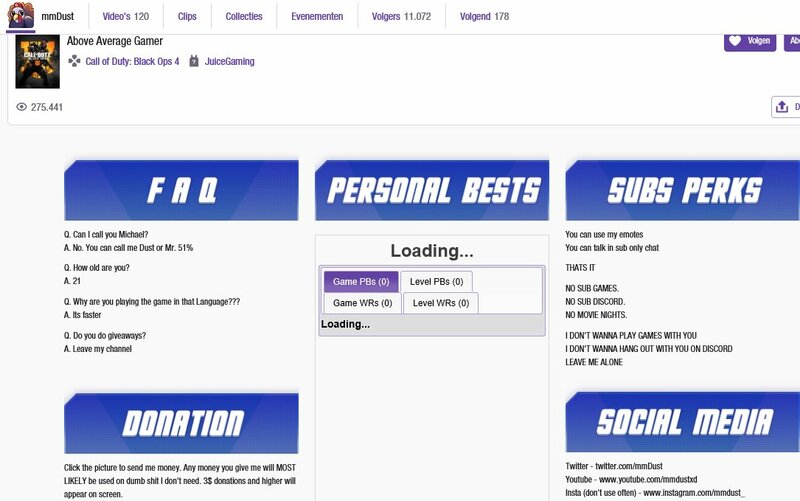 As you can see on the top right under “SUBS PERKS”, he does not want to spend time with any of his subs. The fact that it’s also in all caps, makes it even worse. “You can use my emotes. I DON’T WANNA PLAY GAMES WITH YOU. I DON’T WANNA HANG OUT WITH YOU ON DISCORD.